Implants can strengthen the jawline and create a more balanced facial silhouette by augmenting the mandibular body, angle, and ramus. A wide variety of patients can benefit from this procedure, including those with normal, deficient, or surgically altered anatomy. 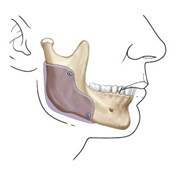 Most patients who desire mandible augmentation have lower face horizontal dimensions that relate to the upper and middle thirds of the face within a normal range. 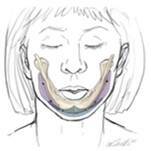 These patients, usually males, perceive a wider lower face as desirable. This group benefits from implants designed to augment the ramus and posterior body of the mandible and, in so doing, increase the bigonial distance (the distance between the mandible angles). 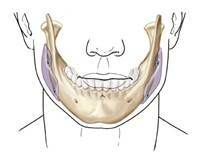 Other patients desire more definition and angularly to the mandibular border. Implants which augment the anterior mandible back to the ramus can achieve this. This patient’s lower jaw is of average size. 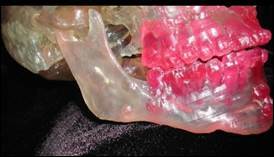 Angle implants provided definition of the lower jaw and better balance between the upper and lower face. Another group of patients who benefit from mandible augmentation are those with skeletal mandibular deficiency. The majority of these patients (approximately 80 percent) can have their Class II (overbite) dental relationships normalized through orthodontic tooth movement. The remaining 20 percent, or 1 percent of the total population, have mandibular deficiency that is so severe that surgical mandibular advancement would be needed to correct it. For these patients with corrected occlusion, mandible implants can provide a visual effect similar to, and, in my opinion, superior to that obtained with surgery requiring osteotomies and rearrangement (sagittal split) of the mandible. Jaw implants can be performed as an outpatient procedure. 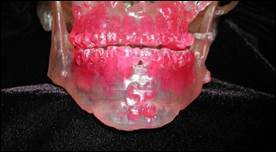 Furthermore, unlike osteotomy surgery, additional orthodontic tooth movement can be avoided. 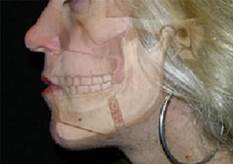 The anatomy associated with mandibular deficiency, which can be camouflaged with implants, includes the obtuse mandible angle with steep mentocervical angle, as well as the decreased vertical and transverse ramus dimensions. 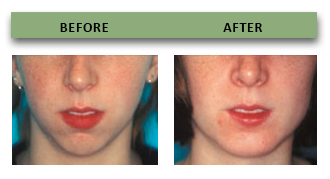 The addition of an extended chin implant will camouflage the poorly projecting chin. This patient with a small lower jaw had her lower jaw brought to normal dimensions with mandible angle and chin implants. This patient underwent chin and posterior mandible augmentation together with submental lipectomy. A third group of patients who may benefit from implant augmentation of the mandible are patients who have had their Class II dental malocclusion due to mandibular deficiency corrected by sagittal split osteotomy with advancement of the distal segment. It inevitably creates a contour irregularity at the site of the body osteotomy and distal segment advancement. It may also result in an aesthetically displeasing position of the ramus angle with insufficient height, insufficient width, or asymmetry. This illustration shows the osteotomies performed during sagittal split of the mandible and sliding genioplasty of the chin. This model shows a mandible that underwent sagittal split osteotomy of the mandible and horizontal osteotomy of the chin (sliding genioplasty). Note the border irregularities, the differences in angle width and mandible ramus height. 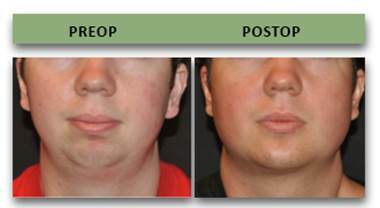 Mandible implants, often combined with chin implants can be used to improve contour in these patients. * This patient underwent chin and posterior mandible augmentation together with submental lipectomy. * This patient underwent chin and posterior mandible augmentation. * This patient underwent horizontal osteotomy of the chin to lengthen it together with chin and posterior mandible implant augmentation. * This patient underwent horizontal osteotomy of the chin to lengthen it together with chin and posterior mandible implant augmentation. Tertiary rhinoplasty and other facial implant procedureswere also performed. * This patient with Treacher-Collins syndrome had a previos sliding genioplasty and underwent additional augmentation with chin and posterior mandible implants. * This patient underwent chin and mandible augmentation.